Scenic trails and historic roads across Massachusetts continue to be preserved, as they showcase the stunning beauty and variety year-round on scenic drives and rambles. Pass captains’ houses, churches and cranberry bogs, small towns, forests and wetlands. Battlefield roads trace military storylines while the state’s highest mountain rising above the Berkshire landscape has served as inspiration for some of America’s most celebrated authors. Step into colonial-era seaports and village centers with a wealth of period architecture. Hotels and family friendly lodgings are found along the way. 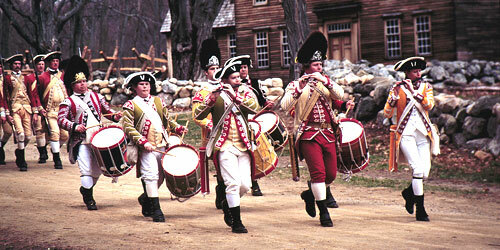 Battle Road Scenic Byway follows the approximate path of the British regulars during the battles that marked the start of the American Revolution on April 19, 1775 – where the “shot heard round the world” was fired. The byway runs roughly parallel to Route 2A along approximately 14 miles of roads in the communities of Arlington, Lexington, Lincoln, and Concord, including part of the Minute Man National Historical Park. Not only is this route famous for its role in the American Revolution – the Battle Road Scenic Byway follows literary, environmental, and technological revolutions throughout its history through today. This trail starts at Mount Greylock State Reservation Park Visitor Center, 30 Rockwell Road, Lanesborough (413-499-4262). 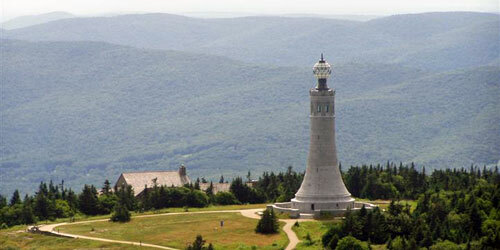 At 3,491 feet, Mount Greylock is the highest point in Massachusetts. Rising above the surrounding Berkshire landscape, dramatic views of 60-90 miles distant may be seen, offering views of five states. This beautiful reserve has a campground as well as many trails to hike. Many authors, including Henry Thoreau, Herman Melville, and Nathaniel Hawthorne, have been inspired by visits to this mountain. Trail ends at Western Gateway Heritage State Park, 115 State Street, North Adams. Allow 2.5 hours with stops at the Moutn Greylock visitor center, summit, and Western Gateway Heritage State Park. Plan for five hours if your tour involves light hiking. The feet that trotted the Mohawk Trail Scenic Byway have left their marks in history. Benedict Arnold led an army down the trail. Before him in time strolled Metacomet, or "King Philip," as the British called him. The trail got its name when the Mohawk tribe marched and destroyed the Pocumtucks in a fierce battle; in friendlier times, it was a trade route. Best of all, parts of this ancient path still exist and are available for visitors to hike. The byway also has over 100 attractions to see, ranging from old pilgrim churches, to the beautiful statue "Hail to the Sunrise," to the gorgeous one-of-a-kind Bridge of Flowers in Shelburne Falls. Come see one of the oldest roads in the nation. Travelers on Old King's Highway, Route 6A can see hundreds of historic sites. These range from sea captain houses, to pilgrim churches, to other historic buildings. Other points of interest include cranberry bogs, salt marshes, preserved farmlands, nature museums, the magnificent Sandwich Boardwalk, and many antique stores. The present day byway was once an Indian trade route, traveled for thousands of years. When the pilgrims arrived, they used it for their carts and wagons, which widened the path. This byway is also well suited for bicyclists. It often follows along the coast and passes through the towns of Sandwich, East Sandwich, Dennis, East Dennis, Brewster, East Brewster, and Orleans. Jacob’s Ladder Trail Scenic Byway is a rural roadway that runs through the foothills of the Berkshires in western Massachusetts. Follow the byway through vistas of forested hills, the rock-strewn Westfield River, open fields, small towns, wetlands and steep rock ledges. Along the way are three entries into the Chester-Blandford State Forest where you can find parking areas for hiking, camping, cross-country skiing, and snowshoeing. Cultural attractions along the way include Jacob’s Pillow Dance Festival in Becket; Tanglewood, summer home of the Boston Symphony Orchestra; home in Lenox of novelist Edith Wharton; theatrical productions of Shakespeare plays are performed at the gilded Age estate Ventfort Hall. If you enjoy 19th-century architecture in its original setting, spend time in Lee Center, which has been a movie set more than once. Travelers along the Essex National Heritage Area Scenic Byway will see historic seaports, Colonial era farms, village centers, and a wealth of period architecture. Set against the backdrop of New England's largest salt marsh, the byway traverses six communities and is anchored at each end by the destination cities of Gloucester, a large active fishing community, and Newburyport, a historic shipbuilding and trade port renowned for its Federal Period architecture. Along the way the route passes through Essex, a small community with extensive farmland, woodlots, marsh views, and a thriving antiques trade. The coastal towns of Ipswich, Rowley and Newbury, among the country's oldest settlements, are well-known for their collection of First Period dwellings and other vestiges of 17th- and 18th-century rural New England like town greens, burying grounds, meeting houses, and early maritime sites.